We’d love your help. Let us know what’s wrong with this preview of Big Nate's Greatest Hits by Lincoln Peirce. Eleven-yea The more Big Nate , the better! Readers will have their fill of Nate's wisecracks and school day shenanigans in this giant collection of hilarious comic strips. To ask other readers questions about Big Nate's Greatest Hits, please sign up. 'Big Nate's Greatest Hits' by Lincoln Peirce asks the question "Can you ever get enough Big Nate?" Thankfully, the answer is a resounding "No!" Weighing in at 376 pages, this collection is huge. It does collect three other Big Nate books ('Big Nate Makes a Splash,' 'Big Nate Dibs on This Chair,' and 'Big Nate Pray for a Fire Drill'), so do take note of that. Nate Wright is 11 and lives with his single dad and older sister. He likes playing sports, is good at cartooning, but is not the brightest ki 'Big Nate's Greatest Hits' by Lincoln Peirce asks the question "Can you ever get enough Big Nate?" Thankfully, the answer is a resounding "No!" Nate Wright is 11 and lives with his single dad and older sister. He likes playing sports, is good at cartooning, but is not the brightest kid in school. We see his struggles with girls, his nemesis teacher, his older sister, all of which seem to be instigated by Nate. Throughout the book are cartoons by "Nate" which feature his characters like Doctor Cesspool, Dan Cupid and Hollywood stuntman Moe Mentum. He also draws cartoons featuring Abe Lincoln and Pablo Picasso. He's obsessed with Cheeze Doodles, the new girl in town, and trying to get away with not turning in assignments. I loved collections like this when I was a kid, and I still do as long as the comics are funny, and these are. This takes me back to all those collections of Peanuts, Garfield, and Nancy and Sluggo I remember reading. The dailies are in black and white, but the Sundays are in color. All are presented one strip per page, so this represents over a year's worth. I had a great time reading this. 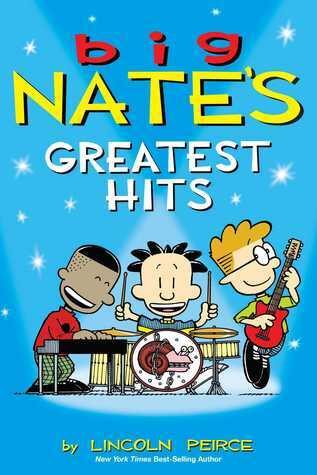 Big Nate's Greatest Hit's is another big hit from Lincoln Peirce. The kids are going to love this book! I know mine did. I have found, while helping in a middle school library and in a elementary school, that kids of many ages love Big Nate. The humor is tasteful, and you feel like you are reading the Sunday comics a little at a time. You can sit and read the book over days, or you can read it all in one sitting. Whichever way you choose to read this new addition to the Big Nate collection it is Big Nate's Greatest Hit's is another big hit from Lincoln Peirce. The kids are going to love this book! I know mine did. I have found, while helping in a middle school library and in a elementary school, that kids of many ages love Big Nate. The humor is tasteful, and you feel like you are reading the Sunday comics a little at a time. You can sit and read the book over days, or you can read it all in one sitting. Whichever way you choose to read this new addition to the Big Nate collection it is a keeper. I received a free copy of this book in return for my honest opinion. I think this book has a lot of surprises because he got a girlfriend after spending years loving Jenny, and picked someone else. This book is thicker than the usual and has more of Nate’s comics. You will meet new characters in Nate’s comics. Some are good but Moe Mentum, The Hollywood stunt man is pretty boring. This big book covers many events like summer school, back to school, Halloween and Christmas. As usual, the teachers in his school are rather funny and I couldn’t stop laughing inside when Mrs Godfrey is present. And Nate managed to land a girl in this one. It is a book. It is a bigger book. I have said book. Nate is a boy. Teddy is a boy Jenny is not a boy Jenny hates Nate. Nate likes Jenny. Nate hate Gina. Gina is not a boy. Gina hates Nate. Nate hates Arthur. Arthur is a boy. Now Nate likes Arthur. Nate likes dog. The dog is a boy. The dog is dumb. Dog likes Nate. amazing I love hoe nate finally has a girlfriend but I wonder why the don't include her in the other comics? This is cute collection of the best comics of big Nate. These are cute little antics and stories he gets into. Each strip is about 2-3 pages so you have a huge selection of them. This is one of those books that go on your coffee table. They are short and silly and a bunch have me in Giggles. the quality of jokes and artwork are the same from page 1 to the end. I think the actual book will have each page be a comic and I think that will be easier to read thru. However the page set up on the Ipad/Kindle makes each comic go to various pages. Nate is a 6th grader that where ever he goes comedy is sure to follow. With his ideas on how to get out of school work (including trying to get out of a test with a fire alarm... that never comes), find a girlfriend and go to summer school with his least favorite teacher laughs are bound to happen. This is a collection of comics that kids are surely going to eat up and want more. Nate is funny and his best friend Francis is funny in his own right when poking fun at Nate without him realizing it. Nate is a 6th grader that where ever he goes comedy is sure to follow. With his ideas on how to get out of school work (including trying to get out of a test with a fire alarm... that never comes), find a girlfriend and go to summer school with his least favorite teacher laughs are bound to happen. This is a collection of comics that kids are surely going to eat up and want more. Nate is funny and his best friend Francis is funny in his own right when poking fun at Nate without him realizing it. A great collection of laughs that will leave readers wanting more. The graphic novel/comic format makes for a quick read and the cartoons of Nate's drawings that are spread throughout the book are a great addition. 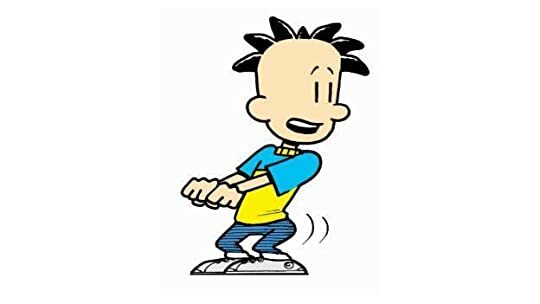 The book I read is Big Nate’s Greatest Hits. The author is Lincoln Peirce. This book really affected me by reading and getting away from my family. It really talks about Nate’s new girlfriend. The author really gets into detail with how Nate feels about his new girlfriend. The author also really gets into detail about Nate’s friends feel about Nate’s new girlfriend. Like Francise says in his head wow he has really gone over the clif or when Teddy another friend of Nate says “by golly your right”. The book I read is Big Nate’s Greatest Hits. The author is Lincoln Peirce. This book really affected me by reading and getting away from my family. It really talks about Nate’s new girlfriend. The author really gets into detail with how Nate feels about his new girlfriend. The author also really gets into detail about Nate’s friends feel about Nate’s new girlfriend. Like Francise says in his head wow he has really gone over the clif or when Teddy another friend of Nate says “by golly your right”. Rating 5 Nate Wright the 11 year old middle-schooler is back in this wonderfully hilarious collection of cartoons. The Big Nate books are ostensibly kids' books, but I'd be wary to recommend them to kids younger than sixth grade. There are a number of more grown-up jokes throughout the series, some obvious and some alluded to, as well as an emphasis on relationships, "going steady," and "making out." Note: I received a digital galley through NetGalley. Big Nate fans will love this newest addition to the Big Nate graphic novel collection. There are a few color panels to add additional interest and new material. Other than that, it is typical Big Nate. My sixth grader objected to the references to kids his age making out instead of doing homework. Otherwise, he thought the book was really funny. This is the by far the funniest book in this series. Every page was a winner. Always enjoy the compilations of Big Nate comics. Nate is always so much fun to read! Its Big Nate You Got To Love It!